Lisa T's World: Popparazzi in action! Liz sent me a great picture she took in Paducah! 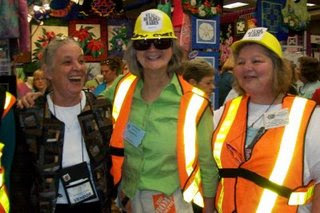 Liz caught Jan T and me with Eileen Sullivan in front of her booth. Eileen is from Atlanta and has spoken at Bulloch Hall Quilt Guild several times. I am so envious of her work and she is so much fun in a workshop. Check out The Designers Workshop at www.thedesignersworkshop.com She's got wonderful paper piecing patterns and her brand new ones are the seashells between Jan T and me. Just lovely. I, of course, bought all the seashells (she says more are coming) and the wildflowers I have been lusting after way too long!! Thanks for sending it along, Liz.